Professional competitive eater Joey Chestnut devoured a record 182 chicken wings to win his second consecutive Wing Bowl, a gut-busting annual event that draws thousands of revelers to the city's sports complex in the pre-dawn hours. Chestnut, surrounded by buxom "Wingettes," had a crown adorned with tiny rubber chickens placed atop his head Friday as his winning total was announced. He also won a 2007 Suzuki Grand Vitara for out-eating his competitors — including a pair of pros who also advanced to the finals. "I love to eat," said Chestnut, 23, of San Jose, Calif. "Today I was swallowing wings, swallowing bones, whatever it took." Begun in 1993 by sports talk station WIP-AM and broadcast live during the station's morning show, Wing Bowl has grown into a massive event drawing a large, beer-soaked crowd and barely-dressed strippers to the Wachovia Center. This year's event pitted 15 locals against five professionals. The top local finisher was "Gentleman Jerry" Coughlan, who finished fourth with 167 wings. He also came away with a new car. 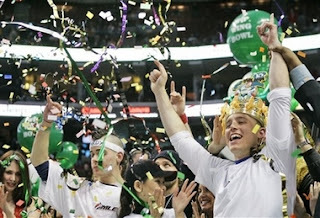 "It's all about Philly," said the event's commissioner, former Philadelphia 76ers president Pat Croce. "Where else at six o'clock in the morning will you get 20,000 drunk guys?" 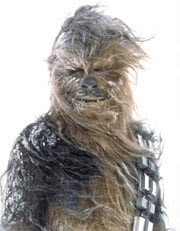 (AP) LOS ANGELES A man dressed as Chewbacca was arrested after police said the street performer head-butted a tour guide operator in front of Grauman's Chinese Theatre in Hollywood. Frederick Evan Young, 44, of Los Angeles was booked Thursday for investigation of misdemeanor battery, police Lt. Paul Vernon said. Police said the 6-foot-4 street performer was seen arguing Thursday afternoon with a tour guide who had expressed concern the Star Wars wookie impersonator was "harassing and touching tourists" in violation of city law. The city passed ordinances last year seeking to crack down on the colorful assortment of actors who perform outside the landmark theater. The move was prompted by complaints from tourists who said the actors were aggressive and abusive if they refused to pay for pictures. Security guards escorted Young off theater property, but he decided to strike back and head-butted the tour guide, Vernon said. "The lesson here is you can have the force with you," Vernon said. "You just can't use illegal force." Young could not be reached for comment. His telephone number was unlisted. The tour guide, Brian Sapir, told the Los Angeles Times that he asked the Chewbacca impersonator to stop harassing two young Japanese tourists when the actor exploded in anger. "He said, 'Nobody tells this wookie what to do,'" Sapir said.